Entering into the Children’s Hospital, there are large photos of little patients with huge success stories. On each canvas there is a statement that says “I AM ….” and it displays a word with a short description of the child’s journey and what they had overcome. I remember April 2014, it was the first time I had ever walked into the children’s hospital. We were there to meet doctors for the first time to discuss the twins’ prognosis. We had some time before our appointment so my husband and I were reading some of the stories of these little miracles on the wall. 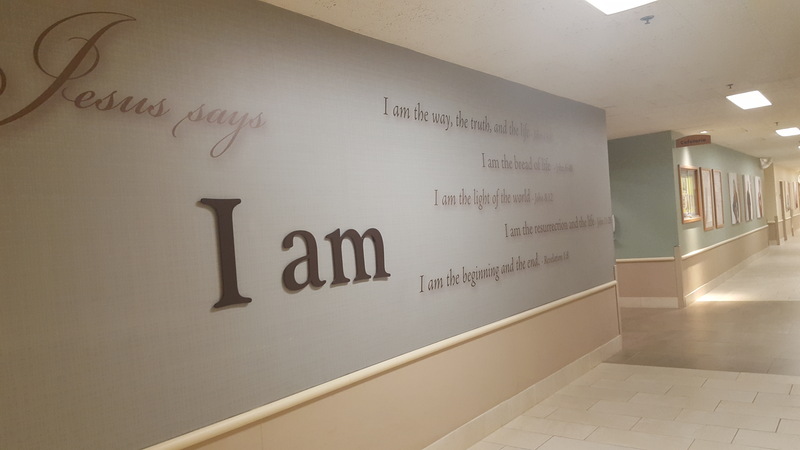 These stories are displayed on every wall throughout the hospital. Some pretty amazing stories of babies and children defying odds and surpassing expectations. During our meeting, it was confirmed that our twins were not doing so well. We were given statistics and odds that were not favorable. We were basically told to expect the worst. I was sad, hurt and very angry. Not at doctors or hospital staff, but at our circumstance. I was angry at what our babies were going through. I called it. I said it. I declared it out loud… my babies will live and they will be on this wall!!! When you speak life into certain situations, you take part in making Miracles. From the moment we were told that Matthew was not going to survive and his twin Callia may not either, I began praying and declaring that the Lords Will be for the twins to survive and for our friends and family be witnesses to some great miracles that can only BE from God. And i have accepted my purpose as a mama and as a daughter of the King to tell our story and give God His Glory. So THAT is what we do any chance we get. For the past three years, our twins, our son especially, has received care from the Loma Linda University Children’s Hospital and has stayed on every floor. Each time I would walk through the halls, I would secretly pick a place where I would want the twins photo to be displayed. This hallway by this door…. or this wall next to the elevator. I was picking the perfect spots where people would be standing and waiting and would read the twins story. I wanted to bring hope and encouragement to whomever would be reading their canvas. And I have to admit, I wanted their canvas on the wall to show everyone that, despite all odds, despite all statistics, reports, probabilities and prognosis’… our twins made it!! Then this… April 10, 2017… I had a missed call from a board member from the children’s hospital. When I called her back, she was not available; however I spoke with another member of her team. She said, “Are you calling for the I AM? ?” I said, “Ummm… I don’t know. I don’t think so. I wasn’t explained on the voicemail what project this was for, just a wall project.” She said, “Oh okay! YES! We would like your twins to be featured on our “I AM” wall. My heart skipped a beat!! The hospital wants to feature our little miracle twins ON THE WALL. They want our miracle twins ON THE WALL. Our twins are going to be one of those miracle stories ON THE WALL!!! For everyone to see. For other families to walk by and read when they feel there is no hope. For other families to read and be encouraged at the moments when they need it most. What a blessing and a privilege this is!! What a responsibility. To be able to share Gods word at an important time for some parents. This is so incredible. God’s Will. His Promise, is coming true!! This is just amazing. I am so excited. I declared it three years ago… and here we are!! These are all the words I need to choose from. There are so many. I don’t know if I can choose just one. I don’t know HOW to choose just one. I just know I need to pray about it. Let the Lord show me which word best describes these two. Once I find out, I will let you all know!! Our official photo shoot is coming up soon and i need to find a couple outfits. I am just so excited for this. A dream come true! Hallelujah! You spoke life to your twins! How exciting that they will now be an encouragement to others! God gets the glory! Amen amen!!!! It was ALL God!!! So blessed to permanently be a part of it!! !